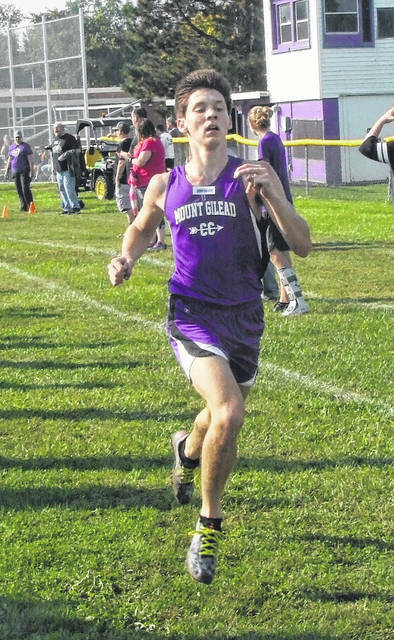 Liam Dennis led the Mount Gilead boys at their home invitational Saturday. Cardington’s Marlo Young led her squad on Saturday. 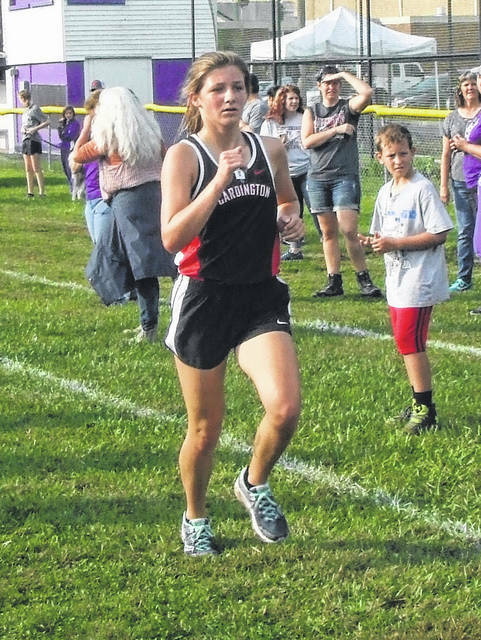 Selia Shipman approaches the finish line for Mount Gilead Saturday. 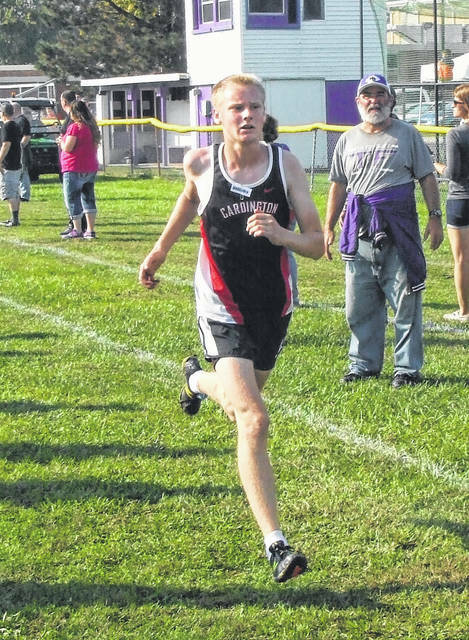 Cardington’s Racine Hallabrin finished 14th in Saturday’s Mount Gilead Invitational. 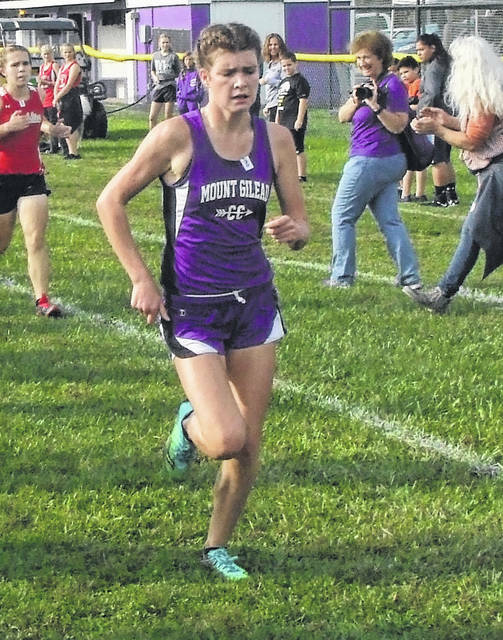 Both Mount Gilead cross country teams finished second at the school’s Ron Thill Invitational on Saturday. Fredericktown claimed both championships. In the girls’ race, MG was able to boast the top two runners, as Allison Johnson was first in 18:49.28 and Baylee Hack took second in 18:58.73. Olivia Millisor was fifth in 21:36.89 and Selia Shipman claimed 10th in 22:29.64. Madison Fitzpatrick ran 17th in 23:32.25, Makayla Weaver placed 23rd in 24:04.3 and Jadyn Shipman claimed 34th in 26:42.74. Also, Emily Randall was 36th, Dakota Shipman was 39th, Adriana Tinch was 41st and Skye Shipman was 47th. For Cardington, who didn’t have a full team, Marlo Young took 19th place in 23:37.91. Bella Scurlock finished 31st in 26:08.17 and Ashlee Drury ran 45th in 32:53.94. Fredericktown also won the boys’ race. MG’s points total was hurt when one top runner came up lame near the finish line and a teammate attempted to help him down the final stretch, resulting in both runners, who would have placed in the top 10, being disqualified. The team was led by Liam Dennis, who took third in 17:03.58. Ethan Supplee finished fourth in 17:06.95 and Casey White placed seventh in 17:23.99. Michael Snopik ran 10th in 18:20.89 and Trevor Ball took 15th in 19:00.64. Eric Mowery placed 16th in 19:05.7, while Brandon Stevens claimed 18th in 19:23.44. Also, Sy Shipman was 20th, Gavin Robinson was 21st, Connor Page was 27th, Ryan Caudill was 28th, Tyler Knight was 29th, Wyatt Harriman was 31st, Ethan Kemp was 34th, Bradley Butcher was 41st, Aiden Honzo was 44th, Mason Kidwell was 46th, Philip Emberg was 48th and Ethan Honzo was 52nd. For Cardington, who finished fourth in the race, Mason White finished in fifth place with a time of 17:07.96. Racine Hallabrin was 14th in 18:56.31 and Kaleb Meade took 25th in 20:18.24. Mike Rose claimed 37th in 21:37.57, while Gage Higgins was 47th in 22:52.29, Devin Gheen took 49th in 23:17.51 and James Hallabrin finished 60th in 25:06.6. Also, Evan Kyrk was 69th. The Northmor boys finished eighth in the 23-team Harding Invitational Saturday. Gavvin Keen led the team by placing 22nd in 17:32.2. Ryan Bentley was 29th in 17:45, while Mostyn Evans finished 44th in 18:21.3 and Kooper Keen took 80th in 18:58.8. Amil Upchurch placed 85th in 19:00.8 and Austim Amens took 87th in 19:01.9, while Chase Hoover claimed 99th in 19:12.5. Also, B.J. White was 125th, T.J. Diehl was 128th and Alec Moore was 155th. Highland also competed in the meet, finishing 14th overall. Dalton Lee ran 32nd in 17:48.6 to lead the team, while Tucker Tague finished 82nd in 18:59.5 and Bruce Jordan placed 94th in 19:08.9. Zach Wetzel took 109th in 19:26 and Alex McCafferty was 119th in 19:44, while Jordan Bellamy ran 143rd in 20:22.5 and Wyatt Groves took 161st in 21:10.5. Also, Rider Minnick was 165th, Nefiano Bumpus was 178th and Chase Higgins was 192nd. In the 20-team girls’ race, Northmor was 13th and Highland placed 14th. The Knights were paced by Sabrina Kelley, who was 49th in 22:19.1. Kristie Wright took 63rd in 22:46.8 and Julia Kanagy was 69th in 23:03.7. Julianna Ditullio took 71st in 23:04.3, Olivia Goodson ran 96th in 24:07.7, Carolyn McGaulley placed 142nd in 26:15.2 and Bailey Snyder finished 145th in 26:36.3. Also, Maddison Yaussy was 148th. Highland’s Camberly Schade led her team by finishing 29th in 21:46.2. Mia White was 66th in 22:54.9, while Julia Pauley took 110th in 24:34.7 and Elizabeth Jensen ran 113th in 24:37.4. Samantha Trusler placed 129th in 25:24.5, Morgan Wilhelm ran 149th in 26:52.2 and Joanna Pauley claimed 163rd in 27:54.3. Also, Hayley Dailey was 168th and Juli Ward was 181st.